Your First Month of Rental Property Management Fees is Free! Everybody likes a good deal, so here is our deal for new property management services customers: Sign a 12-month property management agreement with us for a property in our service area (see map below) and our fee to you for your first month of property management services will be zero…as in, free! Want to hear more? Fill out the One Month Free form or give us a call us at 612-221-7359. Because you only work with Jeff – one of the best rental property managers in Minneapolis, St. Paul, Edina, St. Louis Park, Golden Valley. Big property management companies have high staff turn-over. That guy who was handling your property last week is gone and the new guy? Well, who knows. With Uptown Realty & Management, you work directly with Jeff. He works with property owners who live in the area and lots of them that don’t. It doesn’t matter if you live in Nashwauk or Naples, Florida or Naples, Italy. Hire us to be your property managers and you’ll be worry free. Because we don’t just screen tenants. We select them. We carefully investigate every potential renter. We meet each one in person. We combine an extremely rigorous set of industry vetted written guidelines with our years of experience and our spidey-sense to not just screen, but select the perfect renter for your property. The renters we select won’t wreck the place, they will follow the rules that keep your neighbors happy and they will pay their rent on time. Because we know our Twin Cities rental markets. 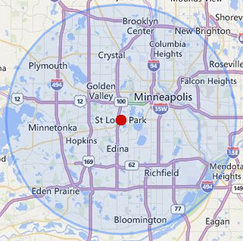 The Minneapolis Lakes area, Highland Park in St. Paul, Edina, St. Louis Park, Golden Valley, Lake Minnetonka. The Twin Cities is filled with unique rental areas, each with different challenges. We know the neighborhoods. We know the amount of rent you can expect. We know the best maintenance people. We know the rental regulations specific to each city. Because we won’t nickel and dime you. No mark-ups on maintenance charges. Plenty of property management companies mark-up maintenance work and charge you for silly stuff. We don’t, we won’t, it’s just not our style. Because down the road….if you want….we’ll help you get it sold. We are licensed real estate brokers with a great history of moving properties in the Twin Cities quickly at a great price. So, if you are not already working with a realtor, we’d be happy to help you sell the property when you are ready to do so. Uptown Realty & Management’s property management service area. One of the reasons we’re so good at what we do is that we don’t spread ourselves too thin. Our property management service area is limited to a geographic area we can get to fast in order to service those properties in the best manner possible. People hire us for all kinds of reasons. Many of our clients have a home or condo that they will not be living in and need to see some return. Some of our clients are experienced landlords who have just had too much of it. Some are banks, some are investors. We work for people in all situations and try to tailor our approach to your needs. Landlording is not an easy job and we have been doing it a long time. One size does not fit all. We are an agile company owned and run by Jeff Thies. We have acquired one of the most advanced and inventive rental property management tech platforms available. AppFolio is the backbone of Uptown Realty & Management’s property management system. You will be paid monetary proceeds electronically. No more checks in the mail. Your renters will be paying rent electronically and all of our accounting will be transparent, readily available and up to date. AppFolio makes Uptown Realty & Management able to be one of the most responsive rental property management companies anywhere. All of Uptown Realty & Management’s properties are licensed as required by law. We will assist you in these processes, as they can be complicated and clandestine. We inspect our/your properties regularly to make sure they are safe and well cared for. This proactive management system assures low turn-over and allows us to offer you the best value in the market.